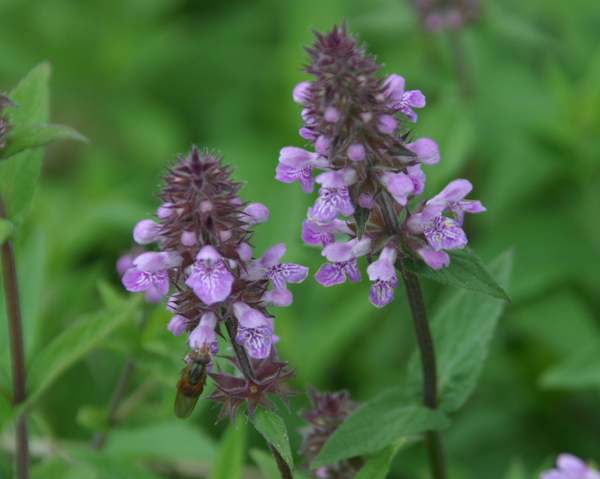 This close relative of Betony and Hedge Woundwort, which are also members of the Mint family, spreads via its seeds, which in waterside locations get carried away by wind blowing them across the surface of the water or, on brooks and rivers, by the current. Vegetative reproduction is also very common, as clones are spread by means of slender underground runners that root at nodes and then produce new young plants. 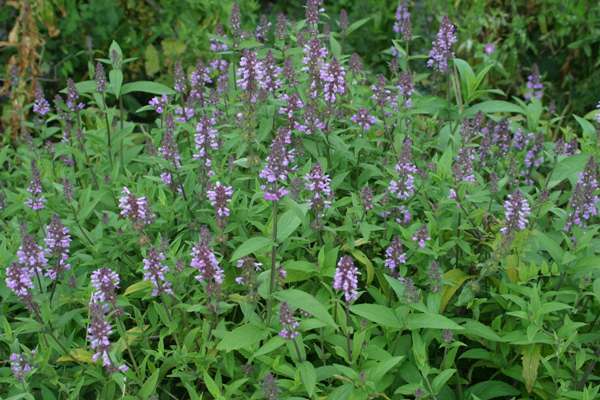 Marsh Woundwort is an erect perennial plant that can grow up to 80cm in height. 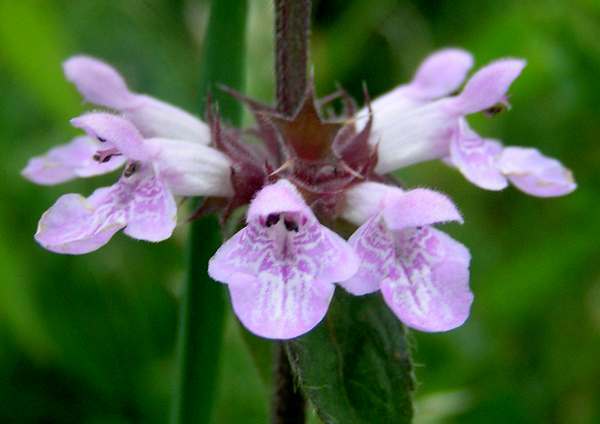 As with other members of the Stachys genus, the solid stems of Marsh Woundwort have a square cross section, and they may be either unbranched or very occasionally branched. The stems are noticeably hairy, particularly in the upper region of the plant, and there are nodes widely spaced along the stem. Marsh Woundwort is found throughout Britain and Ireland, where it is a very common sight in all but the driest parts. This wildflower occurs as a native wildflower throughout most of Europe and in Asia, and it is a naturalised introduction in many other parts of the world including North America. At its best in sunlit places beside ponds, lakes, river and streams, Marsh Woundwort is also seen in damp meadows and on some roadside verges. In Britain and Ireland the flowers of Marsh Woundwort first appear in late May but are not plentifuluntil late June, and in sheltered locations plants can continue blooming well in to September. Unlike the rather similar Hedge Woundwort, which gives off a strong odour, Marsh Woundwort has only a slight smell; nevertheless bees and many other kinds of insects are attracted to the flowers, from which they obtain nectar. Pollination is achieved when insects transfer pollen from one flower to another, and when both Marsh Woundwort and Hedge Woundwort grow in close proximity, as they often do in waterside locations where the Marsh Woundwort takes up the damper areas and Hedge Woundwort stands guard some way back from the water's edge, cross pollination can occur with hybrid woundworts often appearing as a result. Hedge Woundwort is similar in stature and form but has darker purple flowers and stalked leaves; the leaves of Marsh Woundwort are unstalked. Stachys, the genus name, means 'spike of flowers', and plants in this genus do indeed produce flowers in spike form. The specific epithet palustris means 'of swamps', and for the most part Marsh Woundwort is a plant of wet or at least very damp places, including swamps, marshes and ditches.